Rug Renovating Co. provides a full line of specialized rug cleaning, repair, and restoration services. Our trained, certified rug specialists are experts in a variety of services, and do what is needed to restore the original colors and beauty of your fine rugs and carpets. We make it as easy as possible for you, by moving your furniture during pickup and delivery, and spreading your rug where needed. 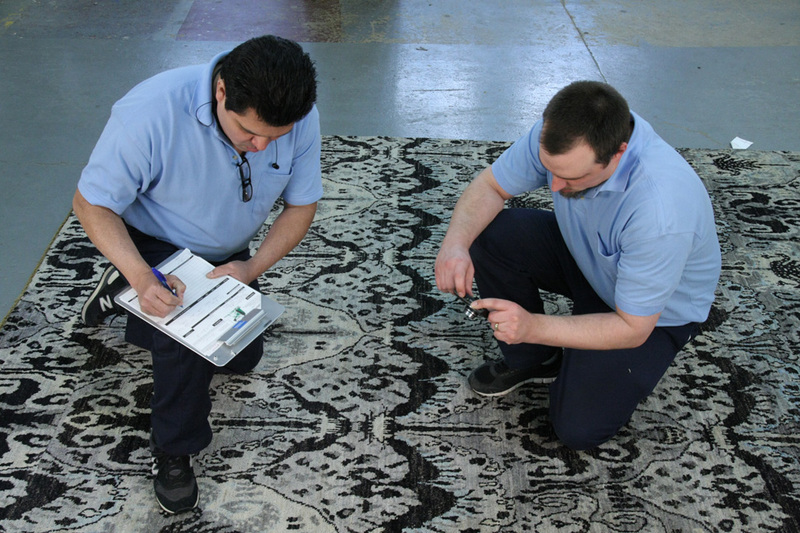 If you are located outside our service area, we accept rugs shipped directly to our facility—the largest in the country—and provide the same restoration and renovation services. Fine rug restoration services – Our fine rug restoration is a specially formulated hand-cleaning process that is performed only by a Certified Rug Specialist. This process is our finest, most gentle cleaning available, and is used on rugs that warrant extraordinary care such as antique, fragile, or valuable rugs. Area rug and carpet cleaning at our facility – To extend the life and beauty of your rugs, we recommend they be professionally cleaned every 2-4 years. Our state-of-the-art facility houses custom-made equipment that allows us to perform our specialized rug cleaning and drying process for optimum results. At the start of the cleaning process, we carefully inspect your rug. We then categorize the rug by type, note preexisting conditions, and then measure and photograph the rug. Prior to washing, and to remove the most deeply embedded dirt, we put the rug through our custom-made dirt-and-soil remover where the back of the rug is agitated, causing the dirt to fall off the rug. The wash step consists of multiple applications of water, specially formulated soap, softener, and a neutralizer. After the scrubbing and washing is completed, the rug is thoroughly rinsed out to remove all the dirt and soap residue. Proper rinsing is critical, and it ensure the rug will not attract soil when it gets back in your home. During the rinse process, we apply a neutralizing agent to the rug for proper pH levels. Lastly, we clean the rug fringe, which requires a different process. We carefully hand-wash and rinse the fringe, and then neutralize it to return it to its original brilliance. Next, we dry the rug. Rug drying is an integral part of the overall cleaning process, and we take just as much care drying your rug as we do washing it. Proper drying is critical. If your rug is not thoroughly dried, problems such as mildew and dry rot can occur. For optimal drying conditions, we dry your rug in our state-of-the-art dry room that is heat and humidity controlled. We hang most rugs, allowing for full air circulation and quicker dry time. The temperature in the dry room is in excess of 120 degrees to ensure bacteria and mildew do not develop. After the rug is dry, we carefully inspect, groom, and vacuum it. After passing quality control, the rug is rolled, wrapped in clear, water-resistant plastic, and readied for delivery back home. Luster Wash – Our patented Luster Wash is the ultimate, yet gentle, cleaning process for most fine rugs and carpets, including Orientals. We immerse the carpet in water and use our exclusive cleaning formula. Specially designed washing equipment allows the cleaning solutions to penetrate freely into the deepest layers of the rug pile, and our gentle cleaning action removes ground-in dirt without crushing the wool. In most cases, this process restores the original look and texture of your rug. Rug drying – Rug drying is an integral part of the overall cleaning process. We dry your rug as carefully as we clean it. If your rug is not thoroughly dried, problems such as mildew and dry rot can occur. For optimal drying conditions, we dry your rug in our state-of-the-art dry room that is heat and humidity controlled. We hang most rugs, allowing for full air circulation and quicker dry time. The temperature in the dry room is in excess of 120 degrees to ensure bacteria and mildew do not develop. Hand cleaning and dry cleaning – We use a dry-cleaning method for rugs requiring the most specialized care. We recommend this process, which is all performed by hand, for silk rugs, extremely fragile textiles, or rugs that contain dyes and colors that might run if the rug is cleaned using a wet-cleaning method. Rug spreading – We can unwrap and spread your rug upon delivery back to your home. Rug blocking – Rug blocking, also known as rug sizing, can help reshape rugs that have wrinkles or are misshapen. When done correctly, resizing makes a rug both more attractive and more usable. If done incorrectly, blocking can distort a rug and ruin its look. A rug is resized by placing it on a specialized floorboard, making sure it is as square as possible, and then securing the rug along the edges. During this stretching and shaping process, we apply a natural starch to the back of the rug. Starch helps blocked rugs maintain their newly restored shape after coming off the board. It is important to note that rarely are rugs perfectly straight—even those of high quality. During the blocking process, we sometimes need to decide what is better for the rug: getting it flat or making it squared. We often opt to make the rug flat rather than perfectly rectilinear. Rug pads – We offer custom-fit rug padding, which is important to the comfort and durability of a rug, and adds to its overall appearance and performance. It also keeps the underside of your rugs and carpets from wearing against a bare floor and serves to absorb the impact of footsteps and furniture on the carpet, which lessens the stress on both the carpet pile and your joints. When choosing a rug pad, we take into consideration several factors, such as where you will use the padding, the type of carpet it will be used with, and the activities and traffic in the room where it will be. Every pad we offer is custom-cut to fit your exact specifications. The rug care specialists at Rug Renovating Co. recommend against having your fine area rug, especially valuable Orientals and Persians, cleaned in your own home. In-home steam cleaning treatments on these fine rugs are ineffective, as they leave behind grit and ground-in dirt, don’t properly clean fringe areas, and rarely remove all the detergent and soap residue, which only attracts more dirt and soil once the rug is back in your home. Further, because the rug is left flat on the floor, the rug’s foundation and back side does not have proper air circulation to dry thoroughly, and leftover moisture can lead to mildew and dry rot. All these factors combine to reduce your rug’s longevity, overall appearance, and value. So if you are looking for quality rug restoration and carpet cleaning services, feel free to contact us right away!